We are happy to announce for all winter 2010 Entrepreneurship Catamaran charters, book 7 nights before December 15th and take $1500 off the listed rate. Newly built in 2007, the 50' Entrepreneurship offers the Catana's reputation for proven performance as a exhilarating fast sailing yacht along with stability and safety of a Catamaran. The large cockpit offers walk in access with full head room for comfort and ease of getting around. The starboard hull is a dedicated king size master cabin built with privacy in mind…perfect for couples celebrating a honeymoon or anniversary with an ensuite head & stall shower. 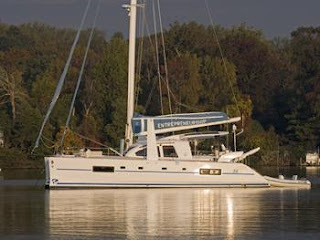 The port hull contains your choice of a forward double and aft twins that can be converted to a double. Both of these cabins are en suite with their own head and shower. Crew will take left over cabin. There is full a/c throughout the boat along with electric heads. Enjoy the sun, swim, explore a new paradise, or simply take a nap on the trampoline, read or listen to music in the shade of the bimini… and most of all, relax.